One of the first signs that Spring is just around the corner is when you begin to see the small white fuzzy flowers and the plant's long green vines streaming along everything in the path of Wild Cucumber - Marah macrocarpus. Long vines, curled tendrils and small white flowers contrast with the more subdued colors of other plants waiting for their turn to produce flowers. Male flowers arrive first and are followed a few weeks later by female flowers. The showy white male flowers are less than an inch in diameter and appear in groups of up to 20. The pollinated female flowers become large spiny seed pods with a resemblance to certain medieval weapons. Wild Cucumber flowers are considered monoecious: both male and female flowers can be found on the same plant. Male flowers tend to be open clusters, whereas the swollen base distinguishes female flowers. An advantage of being monoecious: Wild Cucumber can easily be self-fertilized. 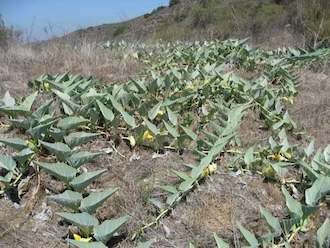 Its leaves are about 4 inches in diameter, and palmately lobed. Large dark seeds are within the pod. The flowers are present from January through June. Over a period of about a month, I observed the transition from flower to seed pod. The fertilized ovary began to swell until it resembled a tiny seed pod and would then be considered a fruit. The fruit then swelled as it ripened ultimately exploding and dispersing seeds. With any luck, these seeds would then sprout in the late winter. The initial shoot heads downward into the ground. At some point, the shoot splits with one segment swelling to form the tuber and the second segment heading to the surface to become the vine. The plant browns and dies back in summer, but the root is quite hardy and sprouts anew in winter, and the cycle continues. The tuber is quite noteworthy as it is very large (100 pounds or more!) - as big as a person, one might say, and one often does, as one of its common names is Man-root. Having such a large root means that it bounces back quickly after a fire. The tuber is quite starchy and forms suds when mashed in water. Don't let its name fool you - there is nothing edible about this plant, it is poisonous. Nonetheless, the root is purported to be bitter tasting, and this gave the plant the genus name Marah, which is a biblical reference of a place with bitter waters. macrocarpus refers to the large fruit. Native peoples are thought to have polished and used the seeds for jewelry or as marbles. The root may have had medicinal uses as a topical treatment for things like rheumatism. Last modified: May 09 2018 16:55:00.